If you tried to reach anyone in our Boston office yesterday, you probably noticed an unusual amount of background noise on the call. 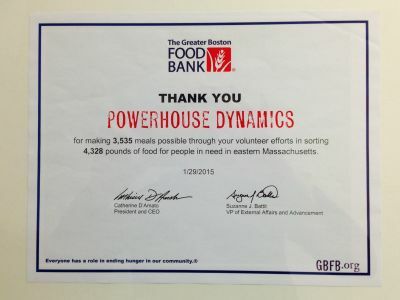 That’s because our whole Boston-based team was sorting food donations at the Greater Boston Food Bank for the afternoon. And we can neither confirm nor deny that there were a couple of customer support calls taken right from the assembly line. 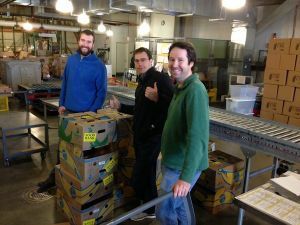 When we’d thought about where to volunteer as a company, GBFB was a natural choice for a company like ours that works with so many customers in the food service industry, many of whom also support hunger relief in significant ways. The GBFB is the largest such organization in New England, serving all of Eastern Massachusetts, and it’s one of the largest food banks in the U.S. Last year, GBFB distributed 50 million pounds of food to the agencies, shelters, food pantries, senior centers, and day care centers who feed the food insecure in Eastern MA. One statistic in particular shocked many of us: 1 in 9 adults is food insecure (meaning that they don’t know where their next meal is coming from), and 1 in 3 children. With that sobering realization, the importance of the work really hit home. 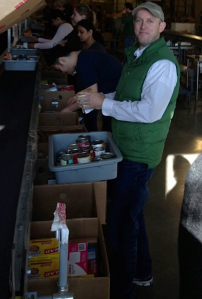 We pitched in with two teams from Northeastern University to sort food in GBFB’s impressive LEED Silver facility in Boston. Working on an assembly line, we unpacked donations, grouped foods together by type, discarded donations that could not be accepted (due to compromised packaging, for example), and reboxed and stocked items now sorted by type for shipment. The day was not only a great education about hunger in Massachusetts and about how much organizations like GBFB rely on volunteers (25,000 volunteers contribute annually to feed the hungry through work at the GBFB), but it was also a terrific team bonding experience in which we all worked together in a completely different way from our normal day-to-day jobs. We’re proud to report that we sorted and packed enough food for 3,535 meals – nearly enough to feed a family of 4 for a year, according to GBFB. At the end of the day, the awesome team at GBFB thanked us, but honestly, we were ready to sign up for our next shift!